No, overflowing with packaged candy. One can become mesmerized at all the choices. And it’s not just at the candy isle. It’s there you when you enter the building, like an ocean of sugar and it’s up to you to find your way out! Enter green smoothies. In this case, a chocolate green smoothie to soothe your sweet tooth and your conscience. I know, there are so many green smoothie recipes out there, each one with their own twist or list of ingredients. But what I really appreciate about the myriad of green smoothie options is being able to try them and experience the variety of flavors all mixed up and smoothed out together. Isn’t it fun!? There are so many possibilities! 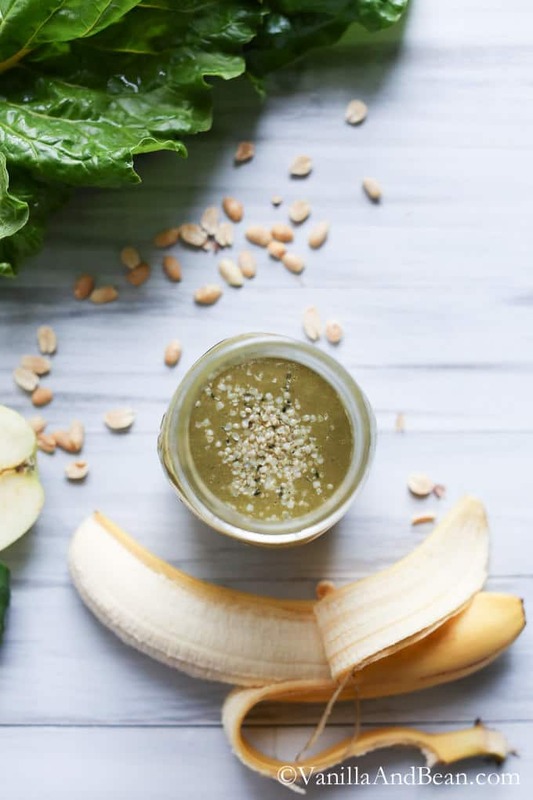 This green smoothie recipe is one of my favorites; a go-to recipe I never grow tired of. I’ve been using hemp hearts on salads, sprinkled in yogurt, in energy bites and regularly in green smoothies since before I started blogging. But in green smoothies, they create an ultra creamy experience! Hemp hearts are packed full of good for you stuff like dietary fiber, protein, manganese, phosphorus, magnesium and essential fatty acids. They are a pantry staple in our home and one that I make sure I always have on hand. Another component of this smoothie that I love is of course the chocolate. I use raw cacao powder. As you know, cacao is a powerhouse of nutrition and makes any green smoothie taste like dessert! Like hemp hearts, raw cacao is packed with good for your nutrients. It is full of fiber, antioxidants, magnesium and iron. It also contains ‘good mood’ phytochemicals to help kick start your day on a positive note. Y’all like chocolate, right? Swiss chard, the leafy green in this recipe, has a long growing season so it’s widely and consistently available. Our local farms have been going it since early spring, much to my excitement, because it’s one of my favorite greens to use in green smoothies. It has a mild and pleasant flavor, and is a powerful source of nutrient dense vitamins and minerals. It is high in vitamin K, A and C, and is a good source of fiber and protein. Did you hear me people? Protein! It helps regulate blood sugar, support bone health and is anti-inflammatory. 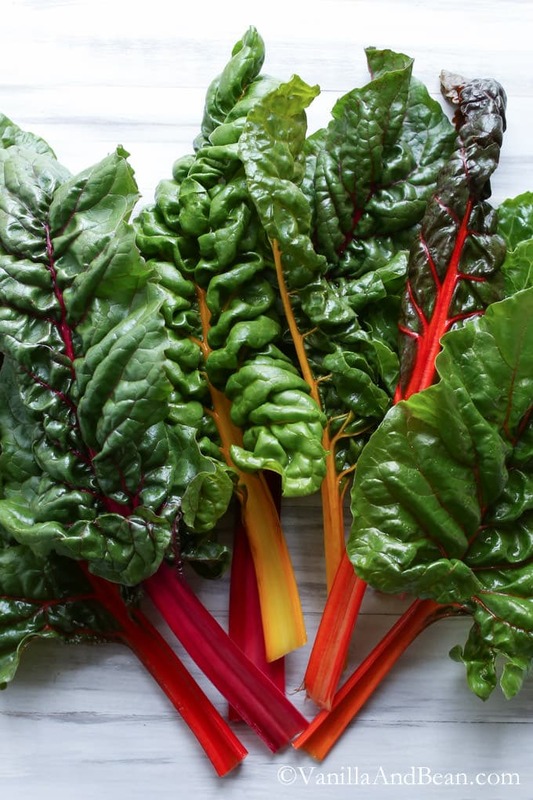 For more about the super power of Swiss chard, check out World’s Healthiest Foods. So, after all the candy of last weekend, it’s time to take a break and have something… well, still delicious, rich and sweet, but on a whole different level! I hope you’ll give this a try! Rich, creamy and packed full of nutrient dense foods, this super smoothie will satisfy your chocolate cravings while keeping your diet balanced. Wash and prep all veggies. Add veggies, fruit, cacao, seeds, milk, water, cinnamon and ice to a Vitamix. Start blending on low and slowly increase the speed. Use tamper as needed. Blend until all ingredients are smooth. Freezing the banana creates an extra creamy smoothie. Adapted from Lamber Jules fabulous recipe. I know, right? Chocolate is amazing! I hope you enjoy the recipe Camille! Hi Michela! I find it completely entertaining to put a bunch of greens in with a variety of ingredients to see how it tastes. It’s so much easier to get my daily greens in this way. And drinking chocolate for breakfast? Yesssss! Thanks for stopping by! Hi Traci, this smootie looks awesome.. I have never tried Swiss chard before but i think i need to now.. Can’t wait to try this.. Thank you, Arpita! Chard is a lovely green and so colorful! Can you just imagine all the nutrition packed in one leaf? I hope you enjoy the recipe! I meant cacao, which is considered chocolate ! I’m always in for green smoothies! But the fact that this one has chocolate in it, make is perfect for me! So healthy, too.Can’t wait to try it! Traci, this looks very delicious again! Hi Evi! Thanks so much! I never get tired of them either… and you know each time you drink one your body is getting just exactly what it needs! They are such an energy booster! Oh I love this! Hemp hearts + cacao create such a rich taste, and I love the idea of sneaking greens in here too for nutrient powers. Looks delicious! Thanks, Kate! One can never have too many greens, right?! I am always looking for new smoothie ideas, and this one is now at the top of my list of ones to try! I have been meaning to try raw cacao for ages, so this will be the perfect opportunity. I love how this is so healthy (great idea to detox after Halloween…we’ll all need this after Thanksgiving and Christmas, too!) – but it’s still so yummy with the cacao and almond butter. Yum! Thanks for sharing, Traci. Hi Laura, you’re welcome! A lovely way to end a workout. A nourishing treat, indeed! Traci! I just discovered hemp hearts a few months ago and I’m loving them so much! They are especially great in smoothies! I ate wayyyyy too much candy for Halloween and thankfully our candy bowl is finally empty! Although someone at work brought a huge bag of halloween candy in for everyone to eat, I think they are trying to temp me! I could really use a chocolate green smoothie right now! I’ve never used raw cocoa powder before, but I’ve been eyeing it and think I need to pick some up now! I’m also slightly embarrassed to say that I don’t think I’ve ever used rainbow chard in a recipe before but it is so beautiful and I need to get my hands on some asap! All that candy is so tempting…. 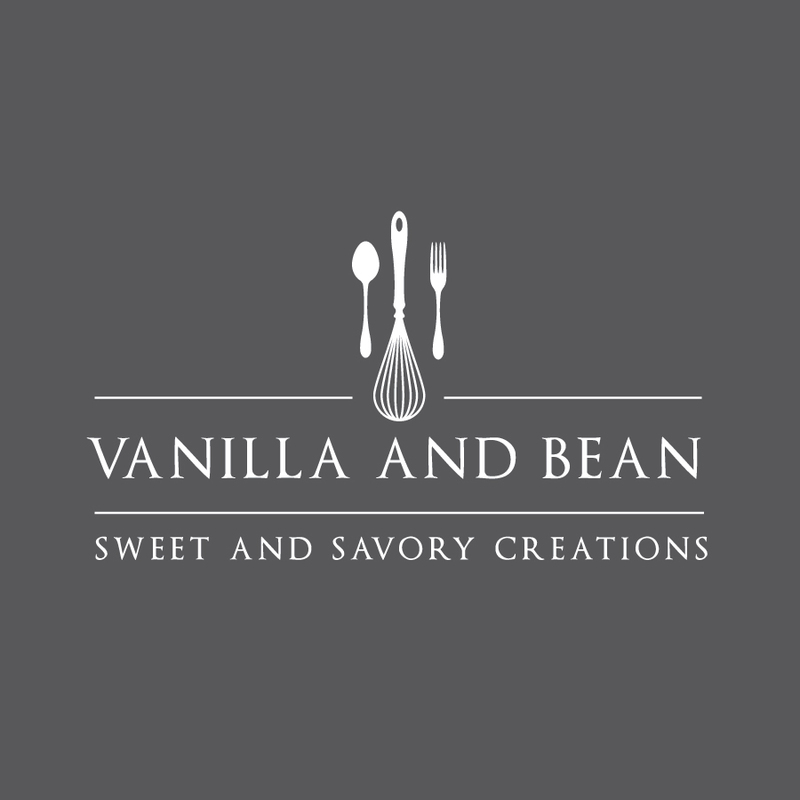 Isn’t it great fun trying new ingredients and their flavors and textures? I didn’t ‘discover’ raw cacao until this past year and I might say, it’s a little addicting in smoothies. Just this morning I broke from tradition and made myself a pumpkin green smoothie… without the cacao and I loved it, very much, but I am looking forward to some chocolate tomorrow morning! Chard is so delicious.. it cooks down like spinach and kale. It is delicious in salads, soups, pasta… you name it! Have a beautiful weekend, Izzy! Thank you, Emily! LoL – trading in you candy bowl! I bet your kiddos would like this… chocolate and peanut butter? I hope yall enjoy the recipe! 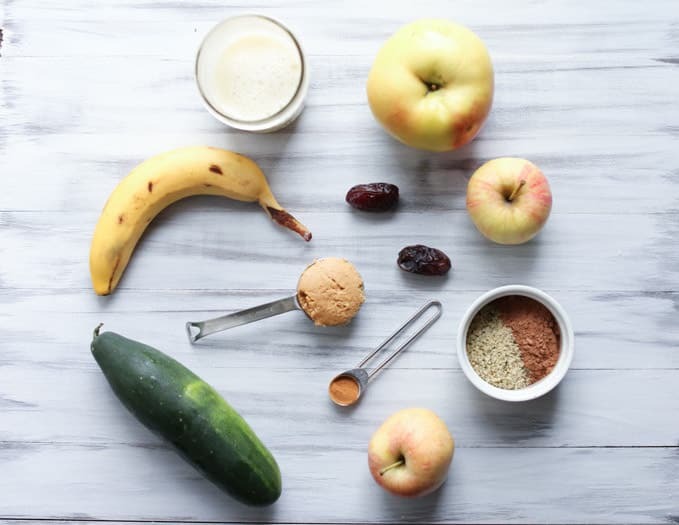 I love smoothies – especially ones packed with healthy ingredients like these. Never had hemp hearts before – can you get them in the supermarket or Whole Foods? 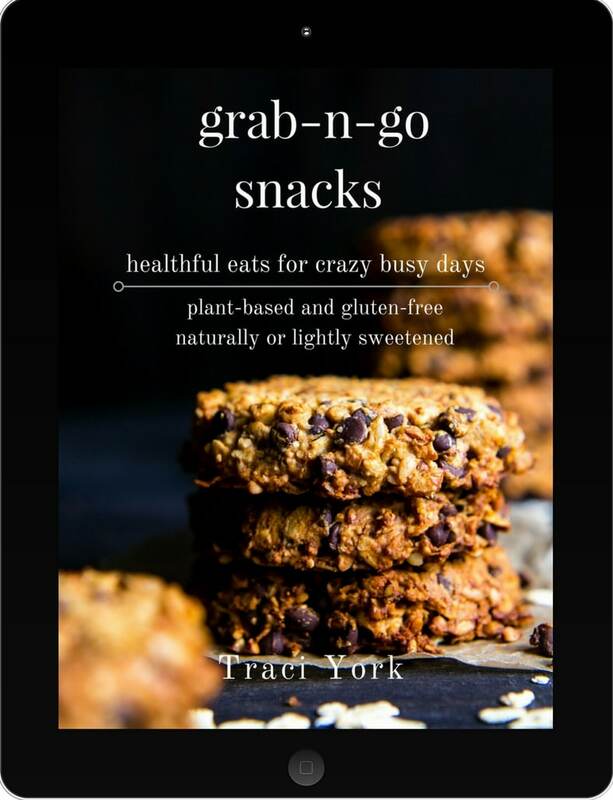 Looking forward to trying this, Traci – I need all the help I can get in the morning :). Love the swiss chard shot – very pretty. Hey Geraldine! Thank you! I’ve seen hemp hearts at Whole Foods, co-ops and of course Amazon. It seems they are growing in popularity. I used to have difficulty finding them, but now it seems I see them everywhere. LOL help in the morning! Yeah, the chocolate in this smoothie really gets me going. It is one of my favorite things! A great way to start my day! I hope you enjoy the recipe, Geraldine! Yesss!! 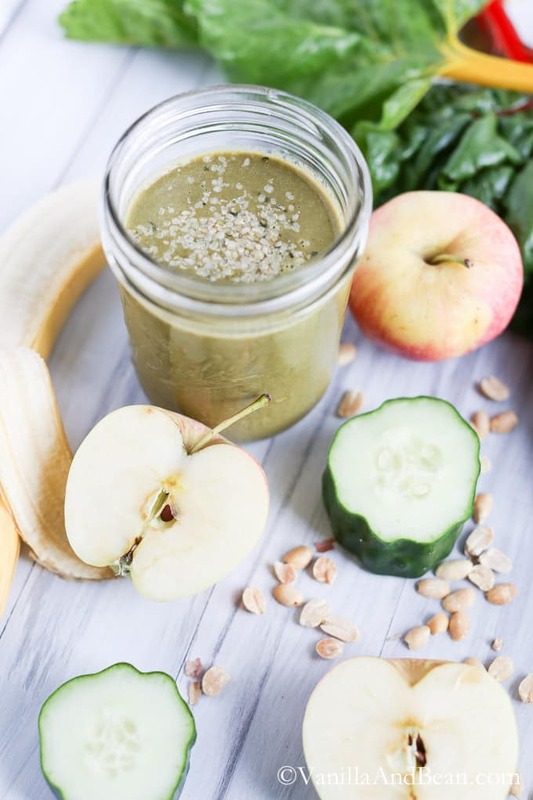 This chica needs a major detox and this smoothie is right up my alley! 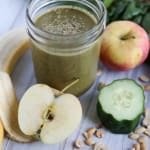 It’s definitely a step up from my typical four-ingredient greenie, which is great and all but gets a bit boring and I would assume is something like running 5 miles everyday.. a great workout at first but eventually you plateau, you know? 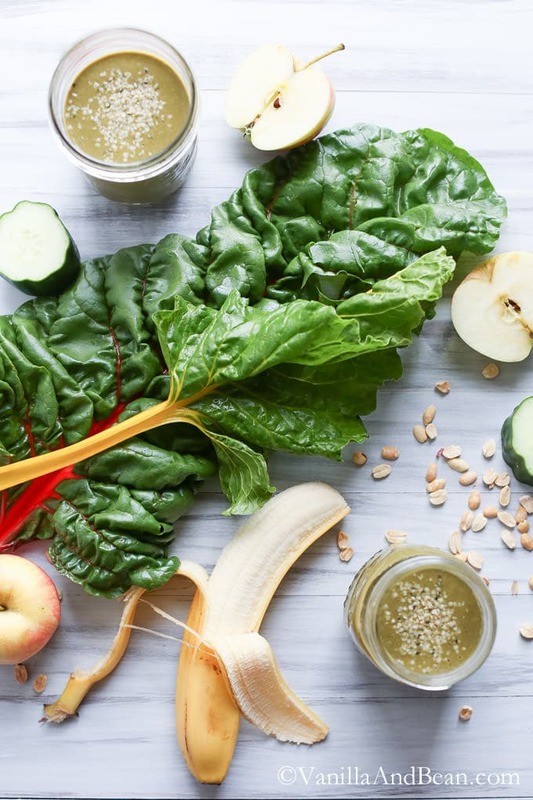 Love the gorgeous chard and hemp hearts! Excellent idea Traci! Thank you, Cheryl! Some mornings call for a four ingredient smoothie, for sure. This one comes together pretty quick, although I often forget to freeze my bananas. OMG 5 miles? Are you doing that?!!? I like smoothies; I really do. But, it seems like they all have banana. I know it’s for a thickener and because the durned things are really good for you. However, I think they are just gross! Soooo, can you taste the banana in this, or is it disguised. Is there a good substitute? I love, love, love by the way the flashing blender shot. However you did it, it is tres cool!